I've been thinking... about games from my past and how fond memories of each still root themselves into how I game today. While some may intertwine, I don't just look at my favorite games of the years past... but those that stuck out in my head as quite memorable for some reason or another. They may not be perfect games, in fact - their quirkiness may be the reason for it being memorable; but I'd still like to share with you, my experience and thoughts on them. The first is a 1992 PC title by Presto Studios (Now defunct) which is tricky to track down. Thankfully, being the hoarder I am of cool things of my past, I kept the actual CD Rom that came with our first PC (a Packard Bell, 75mhz beast of a machine running a fresh new copy of the newly released Windows 95). Yeah, oddly enough, Packard Bell packed in some rather odd software with their PC at the time, I'll go over some of those in a later post like this one. The 1992 title I was speaking of is 'The Journeyman Project'. 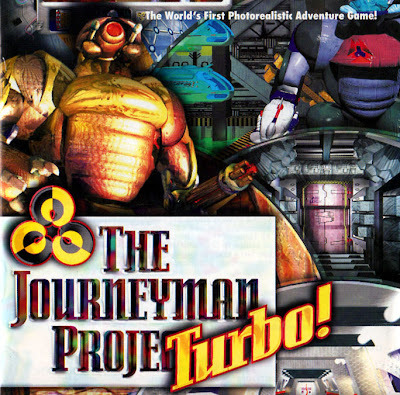 I had the Turbo edition (a slightly updated version over that of the older versions) and it's one of those titles that used special codes you'd need to enter a few times within the game as a sort of "DRM" predecessor in which you'd NEED to have the manual to figure out the puzzles. I remember thinking it so weird that I had to flip through a manual for codes for doors and such, but it was unique to me at least. The game itself takes place in the distant future (something like 2320) where the entire earth is under a unified government of peace; on the verge of a meeting with Alien diplomats whom want to accept the human race into a peaceful alliance of global species. You play Agent 5, whom is part of a company in charge of controlling time travel or fixing things that perpetrators have managed to go back and change. The scientist whom discovered the means behind time travel is the antagonist of the game who sends large, heavily armed robots back in time to sabotage the events leading up to the meeting with the alien forces, as he believes them to have malevolent intentions. You are tasked with averting these changes and going back even as far as the time of dinosaurs to recover discs that hold the records of history needed to compare with the changes being made, in order to prevent them (the discs were hidden during those times for such occasions). 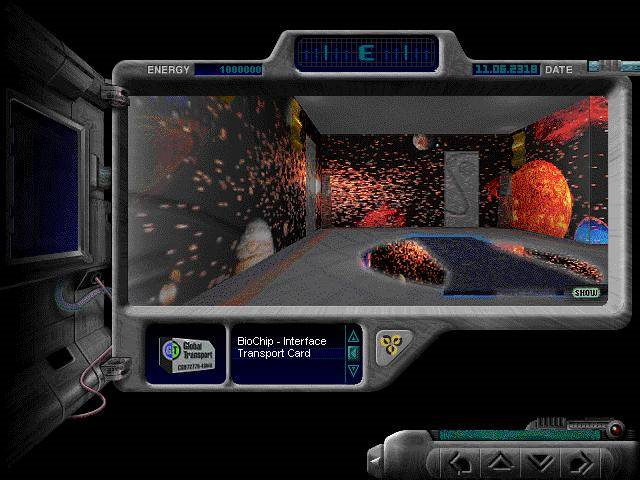 This is your HUD, Interface and gameplay screen. The entire game plays through the view of Agent 5's monocle eye piece, which acts as his hub to the world, allowing him to store data, check his inventory and attach bio-chips to help him in his journey. It's got a slight cyber-punk style to it, with the whole implanted technology bit. The game itself, however, is pre-rendered 3D (not real time, which is understandable for it's time), you get to explore the environments that look much like 3D games do today, but each scene is more like a picture that has interactive pieces within them. You can move Agent 5 forward, backward, left and right and each move is followed by a sort of fade transition to give the impression of walking. 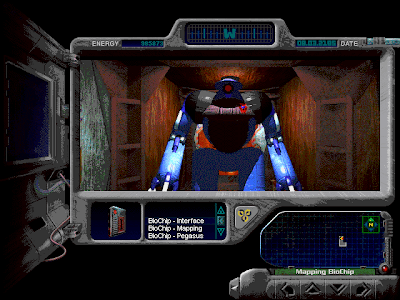 It's a bit jarring for today's standards, but it's completely functional and kind of resembles the idea used in old school point/click adventures... just in a first person view. The gameplay itself really makes you think as the story eludes to what you have to do, but doesn't lay it out exactly. Being that it's only about an hour or two long (if you know exactly what you're doing) it makes sense that they made things vague so that you have to go around investigating things and learning the world for yourself. One of the Robots sent back in time. Also your enemy. There are sequences in which characters and enemies are animated, but generally play out like a short movie where you have choices of what to do. Believe it or not there's even a bit of a morality system in place too as you get to choose to either take down the menacing robots peacefully or aggressively, which effects your final score at the end. The is also a little bit of live action-esc kind of acting to help flesh out the characters... and no it's not as bad as you think. I have quite fond memories of going through it as it's a really unique title. A bit 'pulled back' for today's standards, but interesting none-the-less. It's music too, I fondly enjoy listening to (looked some some vids on youtube while writing this). Sadly, not a lot of copies out there. I did manage to find some on ebay and amazon.com if you're interested. GoG had it's two sequels, but not the original or the revamp. The revamp, dubbed "Pegasus Prime" updated the visuals a bit, including things like better quality FMV bits and actual walking animations between screen transitions. Link for those reading from somewhere other than my site.